You’ve seen the weddings, had the street parties and read the stories. Now experience for yourself how the other half live in a captivating palace tour. From Buckingham to Blenheim, Hampton Court to Kensington – you’ll go behind the scenes of your favourite palace to catch a glimpse of the Royal lifestyle. Step across the threshold of our most cherished landmarks, gaze at paintings from the Royal Collection, or lose yourself in the grand and glorious gardens. The cherry on top? Most tours come with a calorific cream tea or a tasty lunch too. This is a right Royal experience and la-di-dah finery at its shimmering best. Blenheim Palace: Enjoy the fine carvings, hand-painted ceilings and tapestries of Blenheim Palace. Kensington Palace: Enjoy a tour of Kensington Palace, taking in the King’s Gallery and the Sunken Gardens. Hampton Court Palace: Visit Hampton Court’s beautiful State Apartments, gardens and the fantastic maze. Buckingham Palace: This British icon is only open to visitors for a short time each year, so enjoy the chance to observe the grandeur in the Queen’s Gallery. Most palace tour experiences often include a guided tour of the premises and gardens. These experiences are typically combined with a dining experience so may include a tea or lunch, taken at a nearby location such as a hotel or pub, which you can enjoy after the tour. Afternoon tea will normally include a delicious selection of cakes and scones with fruit preserves and cream, sometimes with home-made finger sandwiches, and a choice of teas or coffee as an accompaniment. In this splendid day out you could be admiring the Queen’s Gallery at Buckingham Palace, taking in the tapestries and parkland at Blenheim, or enjoying the Sunken Gardens of Kensington. WHEN: Palace tours take place year-round, although there may be blackout dates. Bear in mind that changes in security circumstances may result in the postponing of your tour. WHERE: The most common locations featured include Blenheim Palace, Kensington Palace, Hampton Court Palace, and Buckingham Palace. WHO: Any Royalist, fan of architecture, or keen horticulturalist will love the opportunity to snoop around a palace or its grounds. Who would refuse an opportunity to be nosey? OCCASIONS: A palace tour lends itself to a birthday present or a Christmas present. It's something a bit different for a wedding anniversary, or even a Mother's Day or Father's Day present. Stroll through Kensington Gardens on your way to the palace entrance. You'll tour The King and Queen's State Apartments where William II and Mary II called home. See the dining room and even take a peek in the Queen's Bedroom. Take a look around the Queen’s Gallery at Buckingham Palace to see around 450 piece of art in a collection that regularly changes. Afterwards, head to the café at Aster Restaurant for a Nordic afternoon tea. Here you'll find treats such as coronation chicken on seeded sourdough, and lavender and peach. A vegetarian option is also available with delicious options including broad bean hummus, asparagus and goat's curd on sourdough, and a beetroot sponge with salted caramel. Delicious! Live the high life with a visit to Blenheim Palace followed by a Champagne Afternoon Tea. 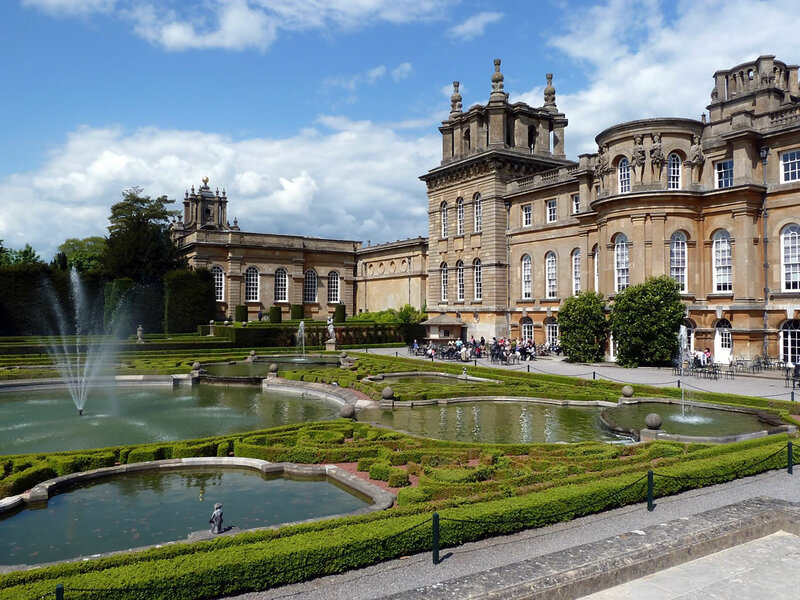 Follow a self-guided tour of Blenheim Palace, peeking at the ornately decorated State Rooms. Head to the elegant Orangery Restaurant for a Champagne afternoon tea of sandwiches, scones with clotted cream and jam, assorted pastries and cakes, and tea or coffee - oh, and a glass of Champagne each too.